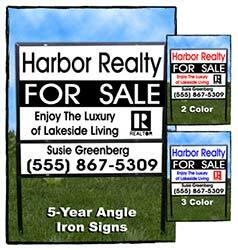 High visibility yard signs are a perfect solution for real estate agents or any other business or individual who could benefit from roadside advertising. We produce them in corrugated plastic or in high quality angle iron and aluminum. 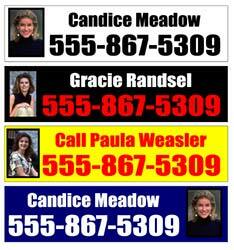 Please select from Corrugated Plastic, Angle Iron and Aluminum and Sign Riders for Real Estate Agents. 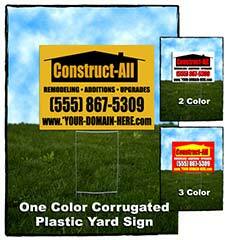 Our corrugated plastic yard signs easily step into the ground when used with our step stakes. They come in many different styles and types. Listed for sale here are some corrugated plastic signs that we offer for sale via this website. Our easy step by step order form allows you to add text, colors and text styles. Please click on the link that corresponds with the sign that you are interested in for purchasing for layout design and information. If you have a need for a specific sign not listed here, please e-mail us with your request. Our rider signs are perfect for the realtor on the go. They measure 24"x6" and come in two different substrates. You can add your company logo or photo to any sign for an additional fee. Listed for sale are some of the most common types of real estate rider signs that we sell online. Our easy step by step order form allows you to add text, colors and text styles. Please click on the image of the type of rider sign that corresponds with the sign that you are interested in for purchasing. We want to see you succeed. We also know how hard it is to find affordable advertising tools without sacrificing quality. This is why we make sure you are satisfied with the design and guarantee our work against manufacturers defects. Our 10 year angle iron yard signs are extremely durable and are made with the highest quality and longest lasting materials available on the market today. The angle iron frame is powder coated and is virtually rust proof. The sign face itself is made from a high quality thick gauged aluminum is will never rust. To finish the sign off we apply our 19 year vinyl graphics to give you a durable sign that is virtually indestructible in the elements.